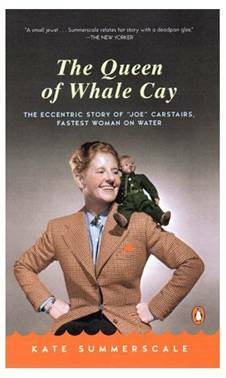 Marion Barbara Carstairs, known as Betty or Joe, (1900–1993) was a wealthy British power boat racer famous for her speed and her eccentric lifestyle. Her parents were a troubled couple who separated soon after her birth. Her mother, an alcoholic American heiress, married three more times. During World War I, Carstairs served in France with the Red Cross, driving ambulances, before going to Dublin with the Women's Legion Mechanical Transport Section. After the war, she served with the Royal Army Service Corps in France, re-burying the war-dead. Later, in 1920, she and a group of friends started the 'X Garage', a chauffeuring service that featured a women-only staff of drivers. Carstairs lived a colourful life. She usually dressed as a man, had tattooed arms and loved machines, adventure and speed. Openly lesbian, she had numerous affairs with women, including Dolly Wilde (Oscar Wilde's niece and a fellow ambulance driver from Dublin with whom she had lived in Paris) and a string of actresses, most notably Tallulah Bankhead. Carstairs married once, to a French Count in 1918 so as to gain access to her trust fund, independent of her mother. After her mother's death the marriage was immediately annulled on the grounds of non-consummation. In 1925, she purchased a motorboat after inheriting a fortune through her mother and grandmother from Standard Oil. She was also given a Steiff doll by a girlfriend, Ruth Baldwin, and christened him Lord Tod Wadley. She was extremely attached to this, keeping it with her until her death although, unlike Campbell's mascot 'Mr Whoppit', she didn't take it into her speedboats for fear of losing it. Between 1925 and 1930, Carstairs spent considerable time in powerboats, becoming a very successful racer, although the Harmsworth Trophy she longed for always eluded her. She did take the Duke of York's trophy and established herself as the 'fastest woman on water'. Carstairs was known for her generosity to her friends. She was close to several male racing drivers and land speed record competitors, using her considerable wealth to assist them. She paid $10,000 of her money to fund the building of a Bluebird for Sir Malcolm Campbell, who once described her as "the greatest sportsman I know". She was equally generous to John Cobb, whose Railton Special was powered by the pair of engines from her powerboat Estelle V. And after she invested $40,000 purchasing the island of Whale Cay in the Bahamas, she lavishly hosted such guests as Marlene Dietrich and the Duke and Duchess of Windsor. She not only constructed a Great House for herself and her guests, but also a lighthouse, school, church, and cannery. She later expanded these properties by also buying the additional islands of Bird Cay, Cat Cay, Devil's Cay, half of Hoffman's Cay, and a tract of land on Andros. After selling the island in 1975, Carstairs relocated to Miami, Florida where she lived until her death in 1993.